It’s no secret that a lot of kids enjoy playing sports. In fact, about 60% of kids in the U.S. play organized sports outside of school. One of the most popular sports among children is soccer. Soccer is a great way for kids to meet friends, get physically active, and learn new skills. But while kids may want to learn soccer skills like dribbling and passing, they’ll also learn a lot of other useful skills. Let’s discuss a few life skills kids who play soccer will learn. They’ll learn failure is okay: It can be really difficult for kids to lose or know they didn’t do as best as they could have done. Because they’re young, their emotional fragility may encourage them to quit after losing a game or falling during practice. But with the help of their teammates and some great soccer coaches, young soccer players will learn that it’s okay to fail. When they fail, they’ll learn what they need to work on. And in doing this, they can continue to practice and do things differently until they get it right. Failure is going to happen, but they’ll soon embrace it and learn from it. They’ll learn to become motivated: When kids play soccer, they’ll quickly learn how much they love the sport. They’ll want to learn soccer skills, improve their speed, and overall play better. 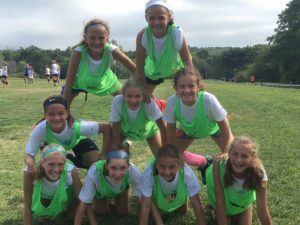 Whether it’s at practice, at soccer camps, or during a game, young soccer players will realize how much fun they have on the field and want to do their best. Motivation is something people need throughout their lives, so learning it at a young age is extremely beneficial and can help them both on and off the field. They’ll learn how to take direction: As young kids, it can be challenging to take direction and learn as a student. Most kids just do whatever they want to do and may struggle with listening to instructions. But on the soccer field, they’ll quickly learn to listen closely to their coaches. Whether it’s during practice drills or in the middle of a game, kids will learn how to take direction from their coaches so they can do their absolute best. Like motivation, listening skills is something people need all throughout their lives. If kids want to learn soccer skills, they’re going to be able to learn important life skills at the same time. Soccer isn’t all physical skill, and your child can benefit greatly from participating in this popular sport.